Just a reminder. 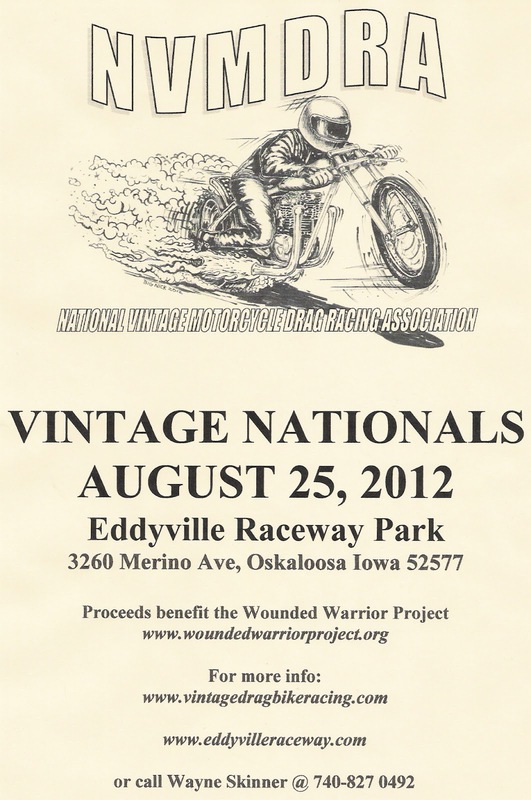 The NVMDRA will hold a Vintage Nationals meet this weekend at Eddyville Raceway Park, Oscaloosa Iowa. The track will open at 5:30 pm on Friday, August 24 with test and tune from 6:30 - 9:30. Race day is Saturday, with the gates opening at 10 am, time trials at 1 pm, and Eliminations starting at about 3. 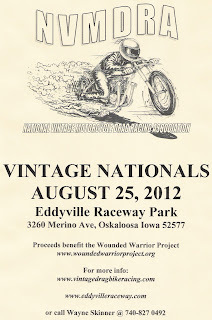 Eddyville Raceway Park is hosting the Vintage Nationals along side it annual "Motorcycle Mania " program﻿, so there should be plenty of late model drag bikes to fill in any lull in the vintage races (or vice-versa). Street bike classes will also be available for both vintage and modern, so there's no excuse not to come out and join in the fun! Vintage Top Gas and Vintage Top Fuel classes are both scheduled to run the 1/8 mile strip, which promises to really give the spectators a thrill old school style. And speaking of spectators, The Wounded Warriors Project has a rally scheduled for this event which may draw from 3000 to 5000 participants. As I left off with the 61 cubic inch EL Bonnie motor, after a detour to make the cam cover usable, I was finally ready to blueprint the breather timing. 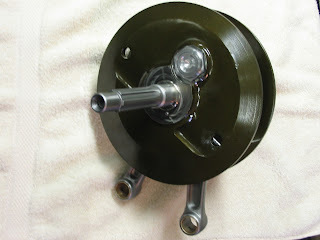 Mocking up the lower end reminded me that I would have to cut the flywheel diameter down to clear the crankcase oil scraper (pre 1940 flywheels were slightly smaller diameter than those used since). Some judicious work on the lathe brought the scraper to flywheel clearance to a snug .006". If the two reading from steps 4 & 5 match exactly (unlikely), you are done. If they don't match, then loosen the degree wheel and move it to split the difference. For example if your reading from step 4 was 9-1/2 degrees after TDC and the reading from step 5 was 10-1/2 degrees before TDC, then move the degree wheel so that its pointer is on 10 degrees. 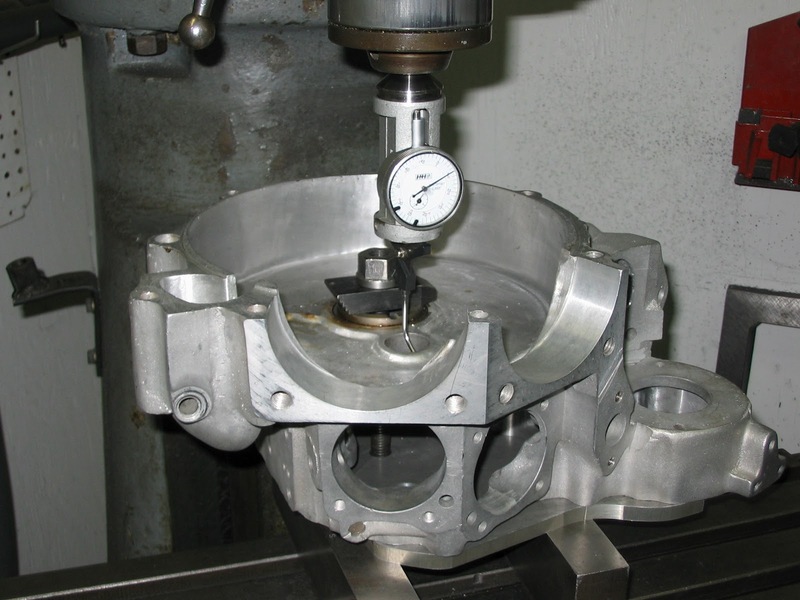 Once the degree wheel was properly installed, the opening and closing specs for the breather gear was checked, looking through the lifter block holes. Rather than go through the process here, I suggest you download the excellent instructions available from S & S Cycle here. Since a degree wheel was installed, it only made sense to check out the cams, especially given the discrepancy found in cam opening and closing specs due to mis-machined lifter blocks. The lifter blocks seemed to be OK, but the exercise did pretty well make the cam choice for me. The KN420 cam from S & S checked out good. The old Sifton, not so much. One intake lobe showed a 12 degree discrepancy on the opening, 5 degrees on the closing (for a total of 17 degrees less duration) and .020" less lift than it should have, all despite showing no sign that it had ever been run. 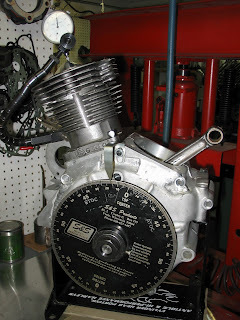 Of course since the motor was mocked up as far as it was, it also made sense to clay the pistons to get a sense of how much valve to piston clearance there was. The answer to that question was a lot. In fact, more than a lot; make it a huge amount. That was a bit worrisome, given the fact that I was already apprehensive about the compression ratio the engine would wind up with. 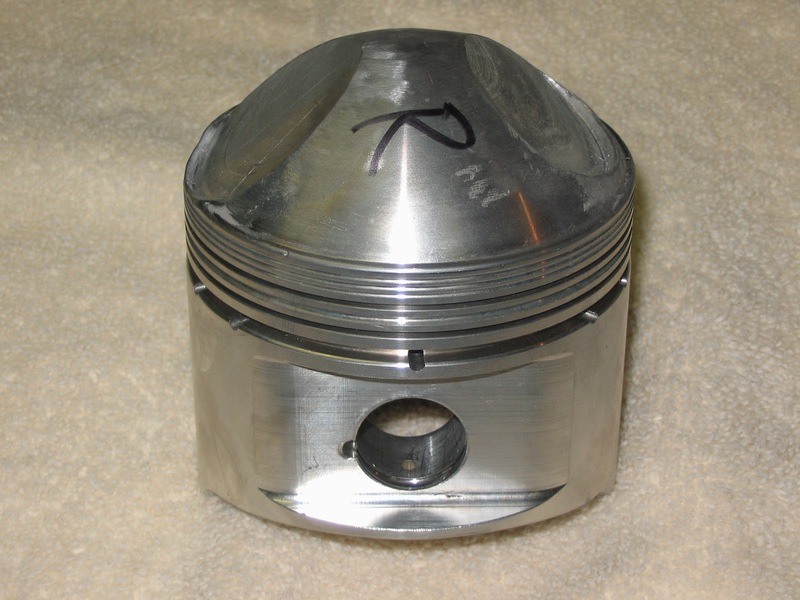 The custom built pistons claimed a 10:1 compression ratio but the large diameter intake valves were sure to need a little more radial clearance in the valve pockets. Given my "druthers" I'd have liked to see 12:1 for a starting point. 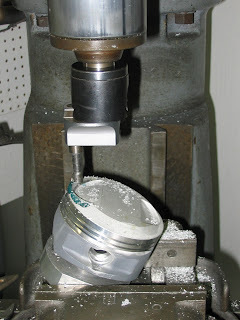 Time to check the piston dome volume, another fairly straight forward procedure which involves putting some grease on the rings, installing the piston into the cylinder to a measured depth, capping the cylinder with a Plexiglas plate and a burret to measure the amount of oil it takes to fill the void. Then by mathematically calculating the number of cc's that would be in the cylinder without the piston dome (using piston depth and bore) and subtracting the measured cc's with the piston dome in the cylinder, the actual dome volume is revealed. Entering all the figures into my Engine Analyzer program, which takes into account head volume, piston deck height, head gasket thickness, head gasket bore and adjusting for fire ring and fire ring volume, I came up with a very disappointing 8.25:1 compression ratio. Worse yet, there was no room to shave the heads due to the proximity of the 2.060" intake valve to the fire ring. Now what? I was really beginning to worry that this little 61" motor would be badly over-cammed at this compression ratio. I decided to call Jim Leineweber of the cam company that bears his name. 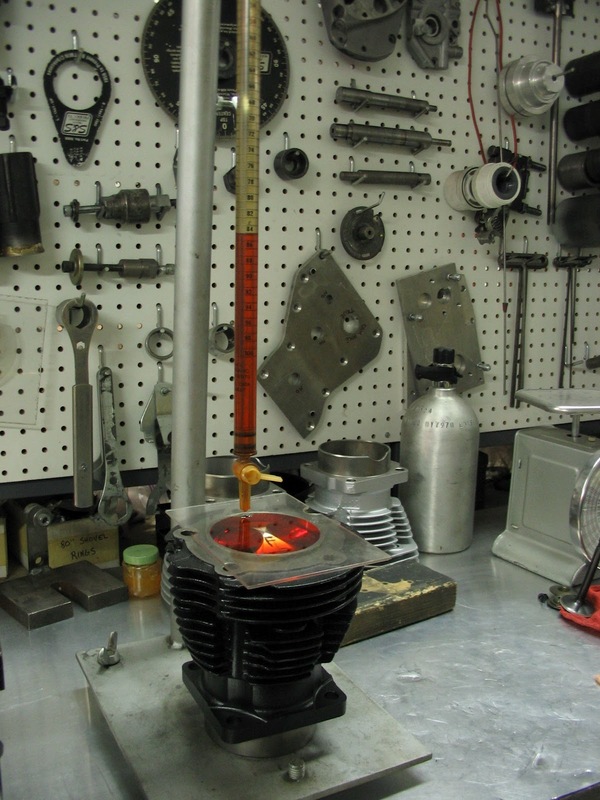 While he was not wild about the low compression ratio, he said he currently had nothing on the shelf that would work any better. Jim did boost my confidence by affirming the clearances that I planned for the various engine parts, but then I always have been one of those who do well on tests. And it really did seem much like an exam, as he asked what each clearance I planned to use, and then gave each of my answers a "OK- that's good - a lot of guys set that too tight." One key piece of information that I was not sure of, Jim provided. Set the ignition timing to 42 degrees BTDC as a starting point. That tidbit probably made the whole conversation worthwhile; though any conversation with a living legend goes down as worthwhile in my book. Now we come to the "don't try this at home" part of the title of this post. 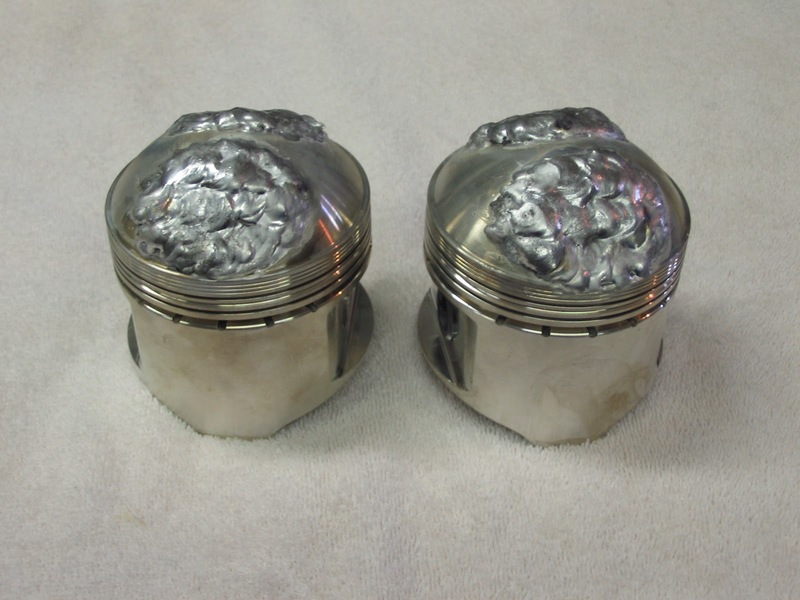 It was far too late to consider having another set of custom pistons built, even if funds had been available for such a thing. But out of the recesses of my mind, I managed to dredge up something that might be of value. Some years ago Mike Roland mentioned to me that he had once welded up the domes on a set of pistons for a drag racer who was on a tight budget. Hmmm. Seemed that a consultation with the best welder I know might be in order. John from PMFR informed me that as long as the pistons were not alloyed with silicone, I should be able to weld on them with no problem. 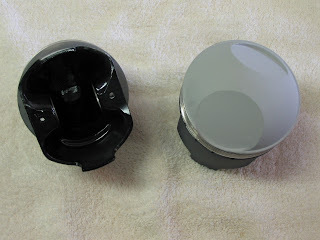 He further reassured me that I would be able to tell the moment I struck an arc - a silicone alloy piston would immediately result in massive amounts of black soot. Still, what would be worse? Going to Bonneville with a motor down on compression, or missing another year because I screwed up the pistons? 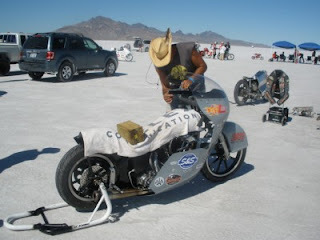 It was about this time that I spent a Sunday afternoon watching "The World's Fastest Indian" again; just for a little inspiration. 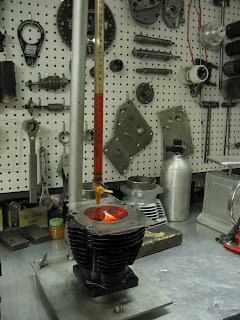 The more I pondered old Burt Munro casting his own pistons in the little shack he lived and worked in, the more I knew I had to give it a shot. Besides, the ceramic coatings I planned to use on the piston domes should give a little extra protection. That's not to say I wasn't still plenty nervous about it. What if I managed to distort the ring lands? What if I screwed up in some other unforeseen manner? And what might that unforeseen screw up be? Obviously no point in pursuing that line of thought. If I could come up with a possible screw up, it would not be unforeseen. 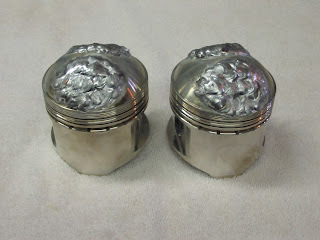 To make a long story short, the pistons welded very nicely. In fact a steadier hand on my part would have resulted in a nice looking job. But, despite the lack of beauty in my welding, I was confident that it was structurally sound - well...at least as structurally sound as one can be when welding a piece that normal people would not consider mistreating in such a way. So, back to the mill to re-cut the valve pockets to a minimum depth, and then mock up with clay once again. 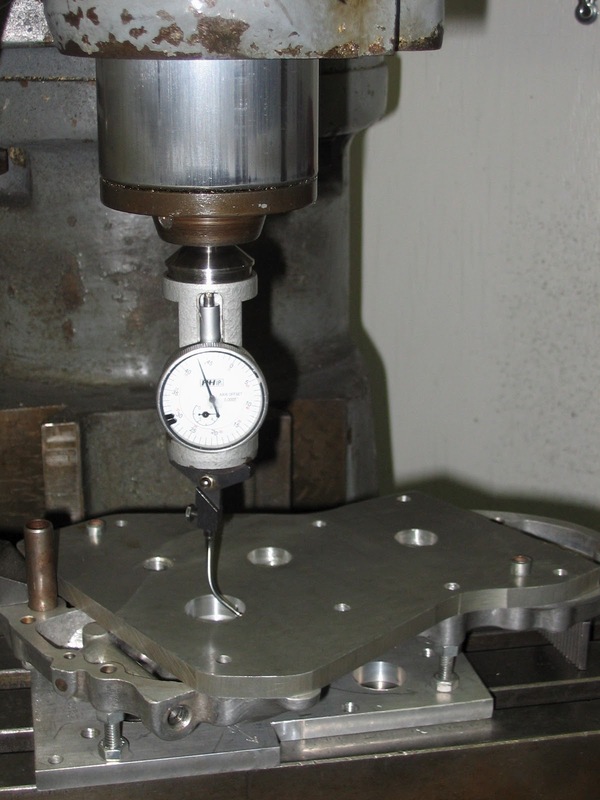 With only a minimum of frustration I achieved valve to piston clearances of an acceptable distance. Back to the same old drill of cc'ing the newly larger piston domes and entering the results into the computer. To be honest, by that point in time I would have been happy to see 9:1, so I was quite pleased to find we were up to 9.8:1! Next up: balancing the flywheels. In my last post on EL Bonnie, I stated that the next step would be to mock the engine up to check/blueprint the breather timing. As is so often the case, easier said than done! My intention was to perform this quick and dirty, without regard to cam bushing clearances, but no such luck. I knew that I was dealing with an inferior aftermarket cam cover, and so at some point the bushings would need to be replaced and line reamed for proper fitment, but I thought I could get by with them for now. The lineage of the cover was quite evident. A certain company who will remain nameless to protect the guilty, reproduces these covers and puts them on their reproduction Knucklehead motors. I have seen one other in the past; it too had damage to the bushings from misalignment. One has to wonder how big a hammer it took to get one of these covers installed the first time. It seems that S&S made the right call in casting their name into the covers they make, if for no other reason than to keep them from being mistaken for these gems. Did I mention that this motor is being done on a budget? It has much in common with something I would build for myself in that respect; a lot of "spare parts" coming together, in some cases those parts finding their way to the build based on availability and price rather than on fitness. Before assembling the case halves for the mock up, I put the cam into the gearcase with the cam cover to ascertain how much it bound up in the bushings- the answer being plenty! Still thinking I could get this done quickly, I chose to line ream the cover bushing an extra couple thousands (the particular reamer I use for this operation is adjustable) since that would surely alleviate the bind and keep things moving. Wrong again! Apparently even the additional clearance was not enough to compensate for the mis-alignment between the case and cover. Time to re- think this. After an appropriate bit of soul searching (to make the decision sound infinitely more dramatic than it actually was) it appeared to be the perfect opportunity to follow the old adage; when life gives you lemons, make lemonade! The cam choices available are a (new) old Sifton 110 or an S&S FHP 420. 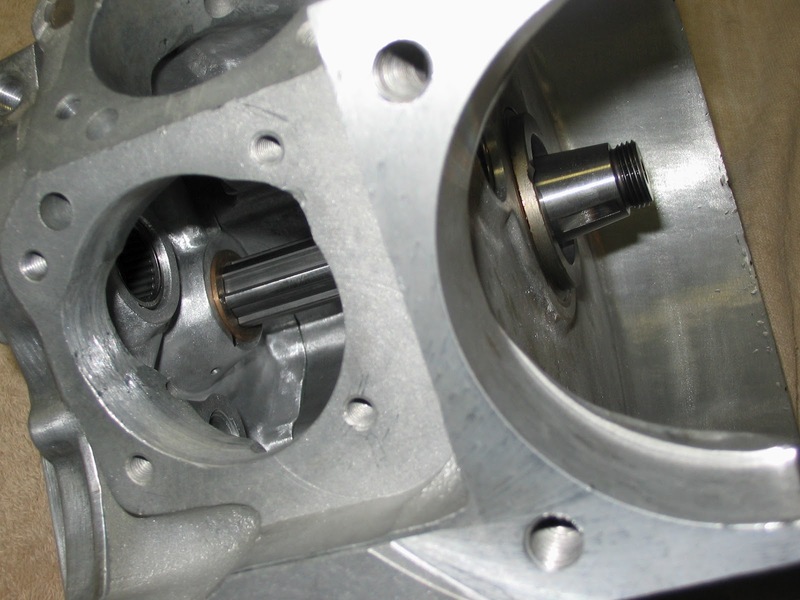 Both of them happen to be set up for a Torrington needle bearing in the crankcase rather than a bushing (the shaft for a Torrington will be approximately .0007" larger O.D. than one for a bushing). 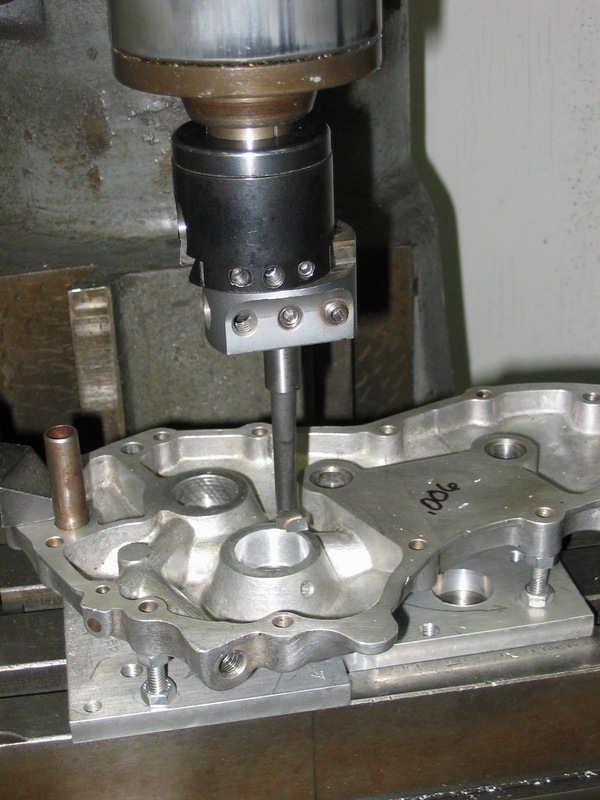 That means that either the crankcase cam bushing would need to be reamed oversize (the original cam bushing had enough wear that it already fit) or the case would need to be bored for the larger outer diameter of the Torrington. 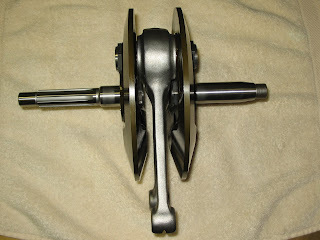 The bearing would have the added benefit of slightly less friction, so it seemed that the logical thing to do would be to use a Torrington on both ends of the cam. 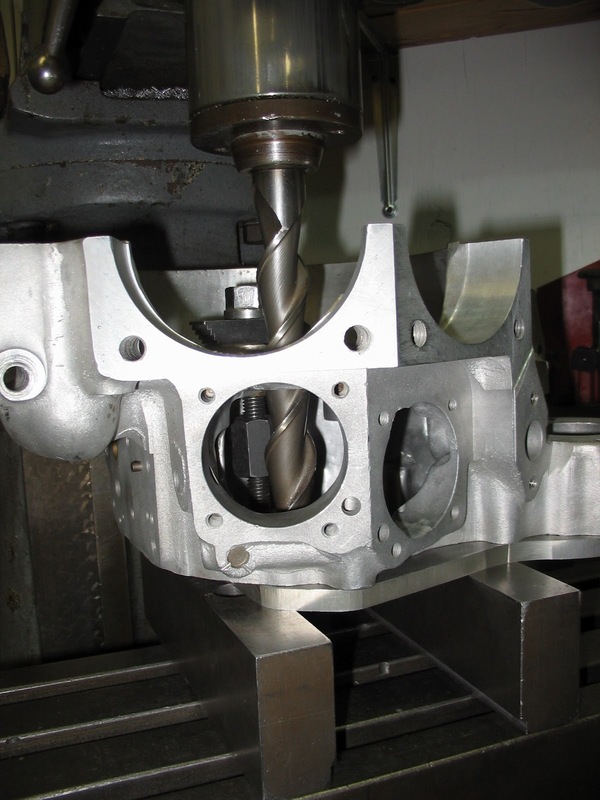 Now, machining to install a bearing in the crankcase is pretty straight forward: indicate in the existing hole and bore it to size. The cover is an entirely different matter though, especially in this case, given there is good reason to suspect it was manufactured with the hole in the wrong place. I decided to create a template. I already had a 3/8" thick aluminum plate with the two dowel pin holes correctly located. 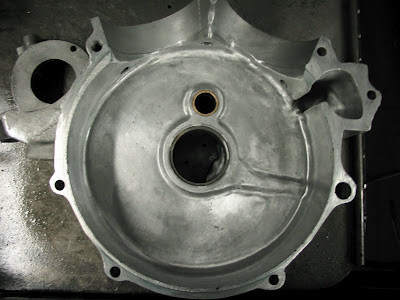 By installing the plate on the crankcase half and mounting it on the mill, I was able to indicate in the cam bushing hole, and then going through the bushing hole, bore the aluminum plate. Once I had a hole in the template, it was simply a matter of fabbing a couple extra dowel pins to align the cover to it. Fortunately, at some point in the distant past I had built a fixture for holding generator cam covers level while installing and pinning bushings. This made mounting the cover in the mill quick and easy. Then, by indicating in the new hole in the template, I had the correct relationship between dowel pins and where the new cam bearing was to be installed. BTW, the original hole in the cover checked as being only .006" off: I expected worse. Once the new hole was bored and a bearings installed in both cover and case, another test fit with right case, cam and cover gave the results I was looking for: a totally free spinning cam! Since I was in cam cover mode, I also tackled the pinion bushing. I chose to go ahead and try installing a new bushing and line ream it, rather than going to extreme measures. Kind of a "why go looking for trouble" approach, and in this case it paid off. Another test fit with the cam cover bolted on the right case and the new S&S pinion shaft with bearings in place resulted in a very pleasant surprise. 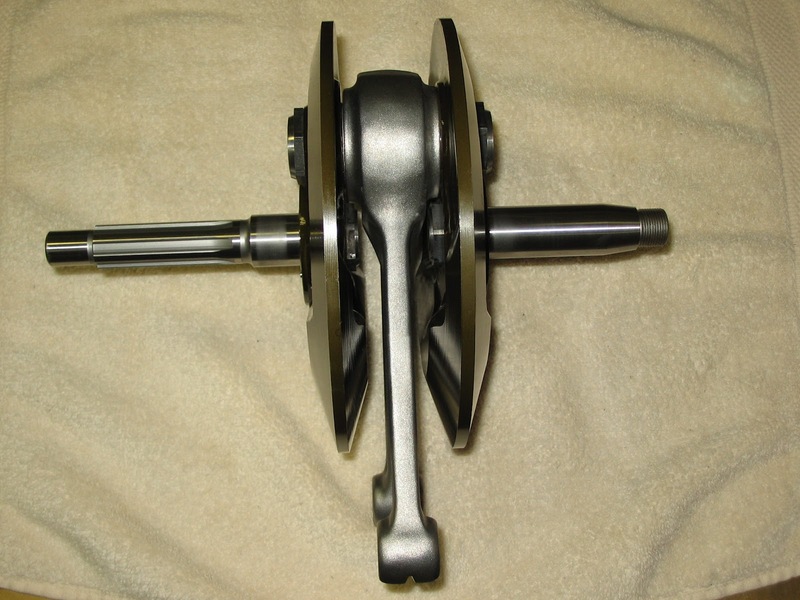 Absolutely no binding even with only .0007" shaft to bushing clearance! It appears that the cover manufacturer managed to get half of the bushing holes in the correct place. By the way, if any of those of you who are anxiously waiting for this motor are wondering, you may feel better knowing that the writing is lagging behind actual progress. Some of fellows from over Wisconsin way have been scheming for several years to put a 1939 61" (model EL) Knucklehead on the great salt flats of Utah - better known as Bonneville. 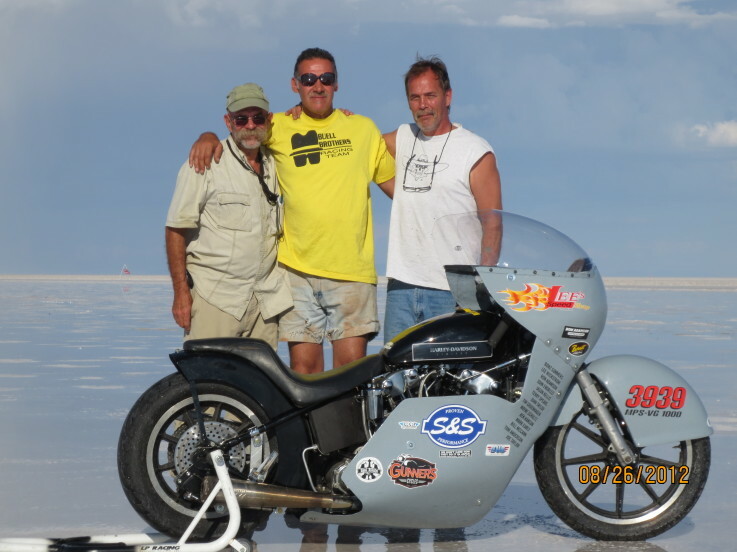 Joe Taylor, the owner of the "project," is joined by Tom Anderson and John Endrizzi in the quest to take home a record in the 1000MPSVG class at the AMA sanctioned annual BUB Motorcycle Speed Trials. 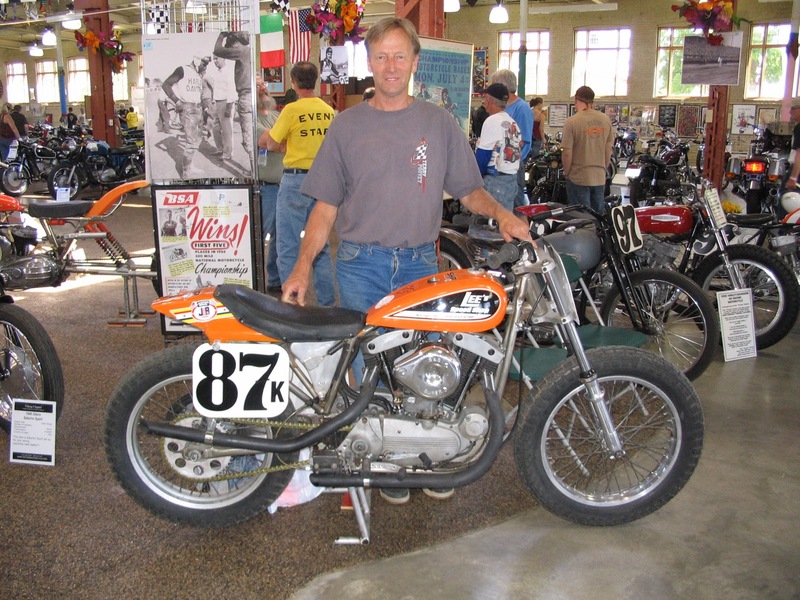 For those of you not quite up to speed on class designations (I fit in that category too) the 1000 refers to the maximum displacement in cubic centimeters - hence a 61 inch Knuckle = 1000cc. The MPS narrows it down further, to a frame that is Modified/Partial Streamlining. The final piece of the puzzle is the VG which stand for Vintage Gas, limiting the engine to a production date of 1955 or earlier. 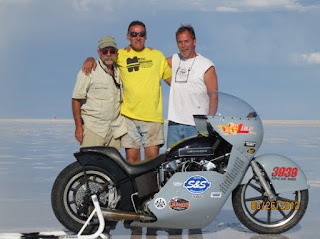 The trio does not walk into this endeavor with no prior knowledge of what they are getting in to; Joe and Tom have previous Bonneville experience racing under the Buell Brothers banner. 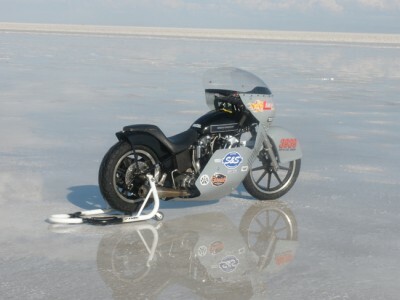 This build will, however, be their first foray into the vintage side of land speed racing. As may be expected, a project like this is not without its setbacks. Too small budgets are almost always an issue when regular guys take something like this on. A major setback in this particular build was the untimely death of the engine builder. That will definitely put a damper on a project! Knowing the predicament that the Buell Brothers found themselves in, I had to weigh my morbidly obese workload against the possibility of being involved in a record setting endeavor. In the end, the deciding factor was this: given my penchant for high performance and knuckleheads, how would I feel if EL Bonnie set a record, but another engine builder's name was associated with it? What could I do but offer my service to build the engine? Before going any further, it is important to note that a project such as EL Bonnie would be virtually impossible to complete without the existence of a company such as S&S Cycle. S&S has made the commitment to reproduce quality engine parts for these early motors. 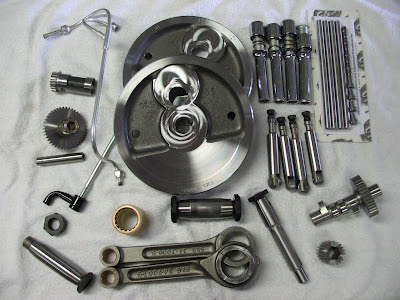 Witness the parts in the shot below; all from S&S, and all vital to transforming this dream into a reality. 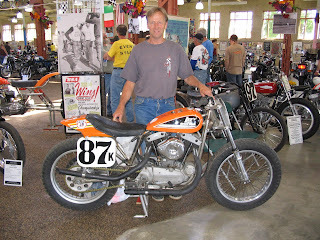 As soon as Joe dropped off the engine, it became apparent that they committed no sacrilege by turning it into a racer. Nearly every square inch of the '39 cases showed evidence of welding repairs. If they could talk, these cases would probably have quite a story to tell. With Joe's permission, I decided it would be worthwhile to do some reinforcement modifications. I added a gusset to the left side of the left front motor mount (which showed evidence of at least one previous repair). Early Knuckle cases are also known to be weak on the left side in the cylinder spigot area. My solution was to weld 3/8" plate to that area, windowed just enough to leave the serial number pad intact. Moving on to the the inside of the cases, windage is always a concern - at least to my mind. The "pocket" in the right side case quite obviously performs no function other than to save a bit of aluminum during the casting process, and I have always pondered what to do with it. What, if any, effect on windage this pocket has is any one's guess. On the other hand, when it comes to racing, I am a firm believer that the difference can often come down to a matter of adding together all the details. I've heard it before: "Do you really think that will make a difference?" My answer is usually, "We'll see." But the more honest answer is no ....but hopefully when it is added to the other dozen things that are too small to make a difference by themselves, it will! A couple of thin aluminum plates cut to fit and welded into place smooth out the interior of the right case half. 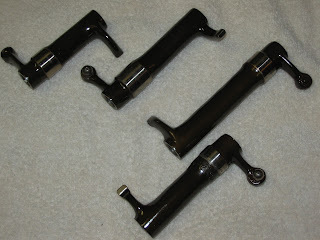 The next step toward minimizing windage was to polish the interior of the cases, including the gearcase. One of the final steps before final assembly on the case will be to treat them with TLTD, a oil shedding thermal dispersant coating. So, if all the previous repairs had not distorted the cases, it was a good bet that with the welding I did, there was reason for concern! Besides, one of the keys to making this motor fast will be to keep the friction losses as low as possible. 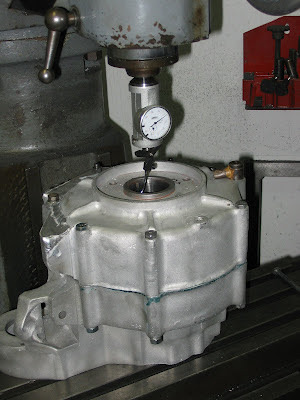 The first step to ensuring that was to mount the left case to the mill and indicate in the pinion shaft race hole (races removed). Once the indicator showed that it was centered in the hole, I gently installed the right case, torquing all the case bolts. Taking a reading from the indicator in the right side case race hole, I was far from shocked to find .012" runout. A +.025 race in the right case was the cure. As shown at the end of the above passage, marriage is a symbol or picture of Christ and his relationship with the church. That would seem to help explain why there are so many dead set on destroying that symbol today. This passage in Ephesians is given to help us understand Christ's relationship to the church by holding up a biblical marriage as an example. Sadly, in the wicked world in which we live, the average marriage bears little resemblance to what scripture tells us it should look like. Still much truth about the nature of the church can be found here, such as Christ is the head and the church is subject to him. Christ loves the church and gave himself for it. He uses the word of God to clean and sanctify the church to make it holy, and even that there is an intimacy between Christ and the church that will be found only in that relationship. If you are a Christian, this should lead you to a couple of conclusions. One is that your own marriage should reflect the values presented in Ephesians 5 so that it does not present a distorted image of Christ and the church to the world. The second conclusion a Christian should draw is that the church they belong to also should reflect the values presented in Ephesians 5 in it's relationship to Christ, so that it does not present a distorted image of marriage to the world.